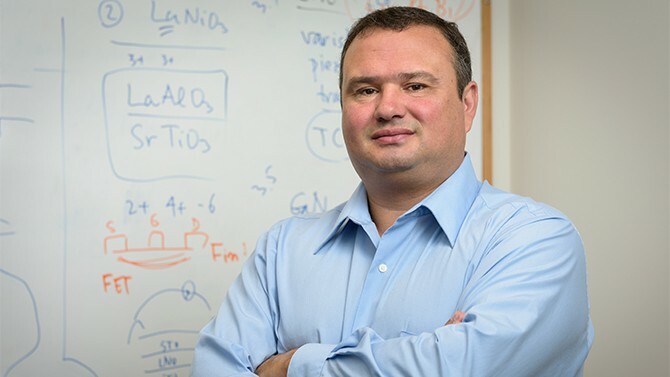 The University of Delaware’s Anderson Janotti has won a National Science Foundation Faculty Early Career Development Award to develop computational models of defects in materials that are used for energy, electronics, and optoelectronics applications. The five-year grant, “Defects and Polarons in Complex Materials,” was awarded through NSF’s Division of Materials Research. According to Janotti, an assistant professor in the Department of Materials Science and Engineering, the ability to control the type and number of defects present determines whether a given material will be suitable for device applications, so understanding and controlling defects is crucial to materials development. Not surprisingly, defects can be detrimental to device performance, as is the case with those that limit the efficiency of solar cells. On the other hand, they can also be manipulated to improve certain desirable characteristics. Computer modeling can play an important role in this effort, as it can complement experiments on materials by providing access to properties and phenomena that are difficult to probe at the atomic scale. With the NSF support, Janotti will use advanced methods of electronic structure theory and supercomputers to investigate the role of defects in a series of complex materials that exhibit an array of physical properties. The research may enhance existing properties and could even lead to the discovery of new ones that can be used in novel device designs. The funding will also enable the training of graduate and high school students. The graduate students will learn cutting-edge computational methods and advanced concepts in materials theory. They will also participate in an outreach program that involves teaching scientific programing to high school students. Through summer internships, the high school participants will develop data-manipulation tools that will help the graduate students with complex data visualization. “Ultimately, we hope the work will identify defects that are detrimental to materials performance in devices and provide a basis to engineer defects, through doping or alloying, to enhance or broaden materials functionality,” Janotti says. Anderson Janotti spent 11 years as a project scientist at the University of California, Santa Barbara, before joining UD in August 2015. A native of Brazil, he earned his doctoral degree in physics at the University of São Paulo. Before UCSB, he worked at the National Renewable Energy Laboratory in Colorado and at Oak Ridge National Laboratory in Tennessee.